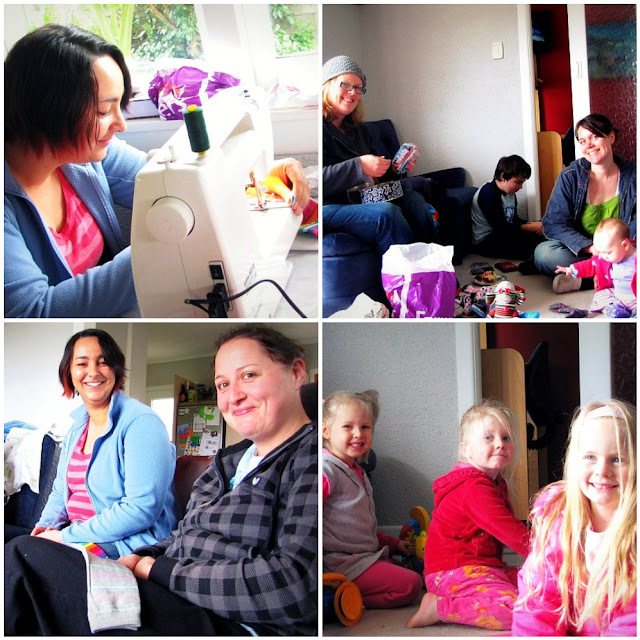 Yesterday, some of the awesome Kiwi Mummy Bloggers in Whangarei, got together to learn how to make Sock Monkeys!!! Our tutor was the amazing sock monkey making Queen, Leonie, and our hostess was the ever so lovely Jacksta (with her flash new sewing machine). Of course we started off with hot drinks and delicious food (including the BEST cheesecake I've ever tasted, made by Jackie), the kids hit it off straight away, and then there was nattering and laughing between us girls before we decided we had better make a start on the monkeys!! Leonie was a fabulous tutor and it was so much fun getting to make my first ever sock monkey. 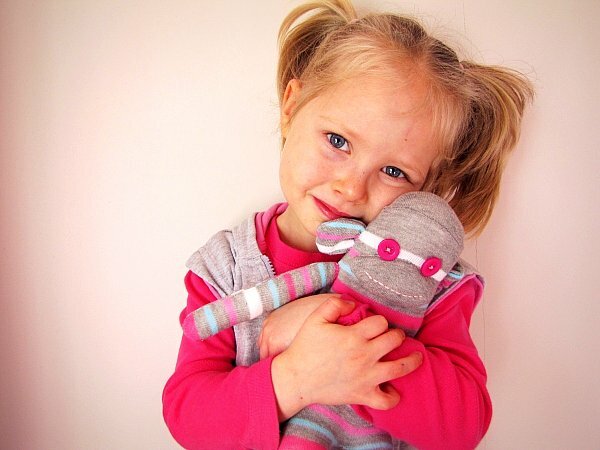 She is going to be doing a sock monkey tutorial soon with a linky for you to join in with your creations. So, a big thank you to my amazing Whangarei blogging buddies - you are all so precious. Was really good to hang out with you Leonie, Tracy, Jackie, Becky and Renette. We also missed you girls who couldn't make it!! See Leonie, Becky and Jackie's take on the day too. 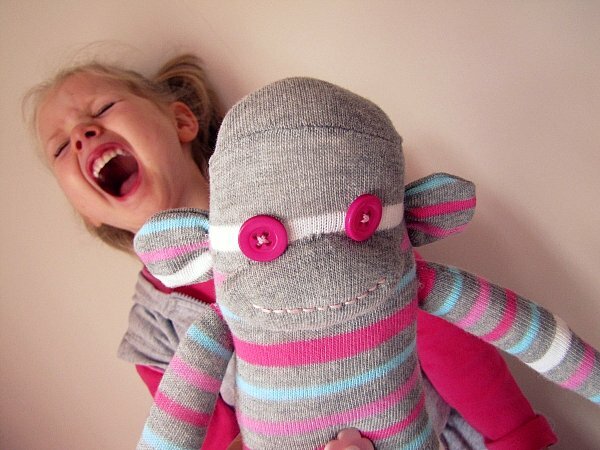 I wanna make a sock monkey! It was awesome, always love spending time with all of you! aw your monkey looks so happy! Love that last pic!! tooooo cute! I love your photos with your girl. So cute. SO dumb I couldn't make it - looks like awesome fun!! Cute lil sock monkeys - can't wait to make my own! 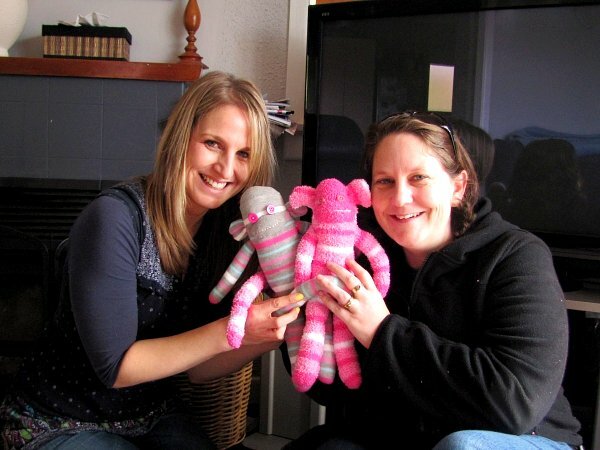 Pink sock monkeys??? What could be better??? Those are so cute! YAY! i'm going to head over and check out their blogs now. My favourite part of this post is the impending tutorial - and my super favourite part is the last photo with your girl!! She looks like she's about to explode from excitement!!! They look adoreable, where did you get those sox??? love the colour combo! i wanna come over and make stuff like this! love the monkeys!! and could we eat the leftover bar biscuits too?? that last pic cracked me up!!!!! such cute monkeys! and such a great kid-friendly craft! Wow that's brilliant! Great photos and it looks like so much fun! MEEEEEEEE too i so wanna make a sock monkey!!! your is very cute.what FUN. My mom bought me some "traditional" sock monkey socks & patterns several years ago, but I have yet to make them. I totally ♥ your striped monkeys -- they are darling! Looks like it was great fun and those little monkeys are completely gorgeous. Both the sock ones and kid ones :-) That top shot is beautiful! Your sock monkeys are so cute! Love the colors!